Schizophrenia is a mental illness which often causes sufferers to be paranoid, delusional and unable to reason accurately. As of February 2011, the cause of schizophrenia has not been definitively determined. Some people afflicted with this mental illness have bouts of psychosis with long periods of "normalcy," while others are in a constant psychotic state. Treatments include medication and therapy. Schizophrenia is a serious condition that is difficult to cope with for both the afflicted and their loved ones, but learning some basic skills may help sufferers and their caretakers deal with this illness. Learn as much as possible regarding schizophrenia. Knowledge is a powerful tool in helping to deal with the disorder as it helps remove fear of the unknown and can dispel the stigma attached to mental illness. Stay up to date on new theories and treatments. Gather information from reputable sources such as mental health professionals and articles written by established psychiatrists (see Resources). Encourage acceptance of the condition by the sufferer. Many schizophrenics vehemently deny the mental illness. According to psychologist and schizophrenic sufferer Frederick J. Frese, convincing a schizophrenic of his condition can sometimes be accomplished by a trusted individual who can "... gradually chip away or 'defreeze' the rigid cognitive defensive structure that constitutes the denial." This could involve giving the sufferer examples of his psychotic behaviors during his most rational moments. Look for patterns and triggers of psychotic behavior. Schizophrenics often exhibit signs that a psychotic episode is coming in which their mood and behaviors become upset and potentially destructive. These signals could be an angry, frightened or confused facial expression, or a physical action such as wringing of hands, pacing back and forth or rubbing the forehead. By recognizing that an episode is imminent, you may be able to help diffuse the situation. Speak to a therapist regarding ways to implement a calming environment when you know a bout of psychosis is coming. Avoid situations which are likely to cause stress. Many schizophrenics are uneasy in crowds or situations where more than one unfamiliar individual is present. According to Internet Mental Health, it is often helpful for the schizophrenic to take herself out of an over-stimulating environment in order to calm down. If the person is required to return to the environment, she is often better able to cope after having a break. Engage in relaxing and fun activities. Schizophrenics enjoy hobbies in the same way as all people. Encourage experimentation with different things such as woodworking, music, dance and collecting. The most effective hobbies for schizophrenics are ones that are creative and do not require much logical reasoning. Engage in relaxation techniques such as yoga and meditation. These exercises are beneficial both for the mentally ill person and those in her life. Learn these techniques from classes, during professional therapy sessions and from videos and books. Be patient as these relaxation methods often require repeated attempts to achieve the benefits. Participate in a support group to share experiences and enjoy camaraderie. MayoClinic.com recommends these groups both for schizophrenics and their loved ones (see Resources). 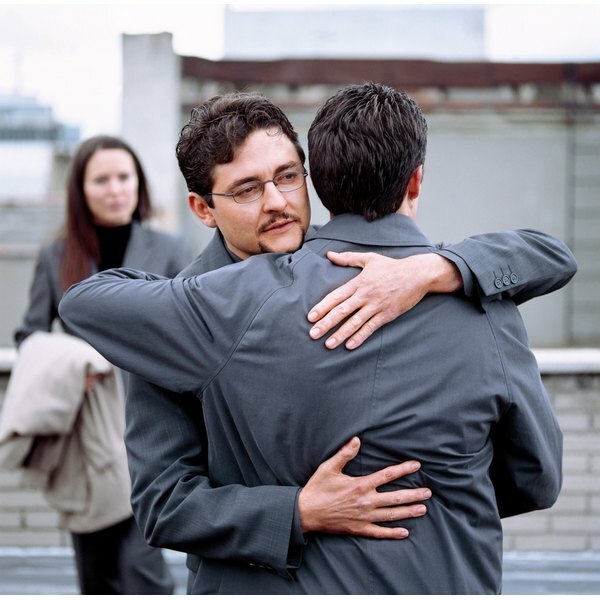 If you have a friend or family member with schizophrenia, let him know you want to help him cope with his illness and will not desert him when times get tough. Set up a daily schedule which includes a particular time to take medication.